An easy to use antiseptic spray Wound Gard is a highly recommended wound care product for cats. This topical bitterant spray is used to treat all types of wounds including post-surgical wounds. The bitter taste prevents cats from licking, traumatizing and damaging the wound. The antiseptic formula controls infection and spread of wound. It helps to repair damaged cells and heal faster regaining cat health. 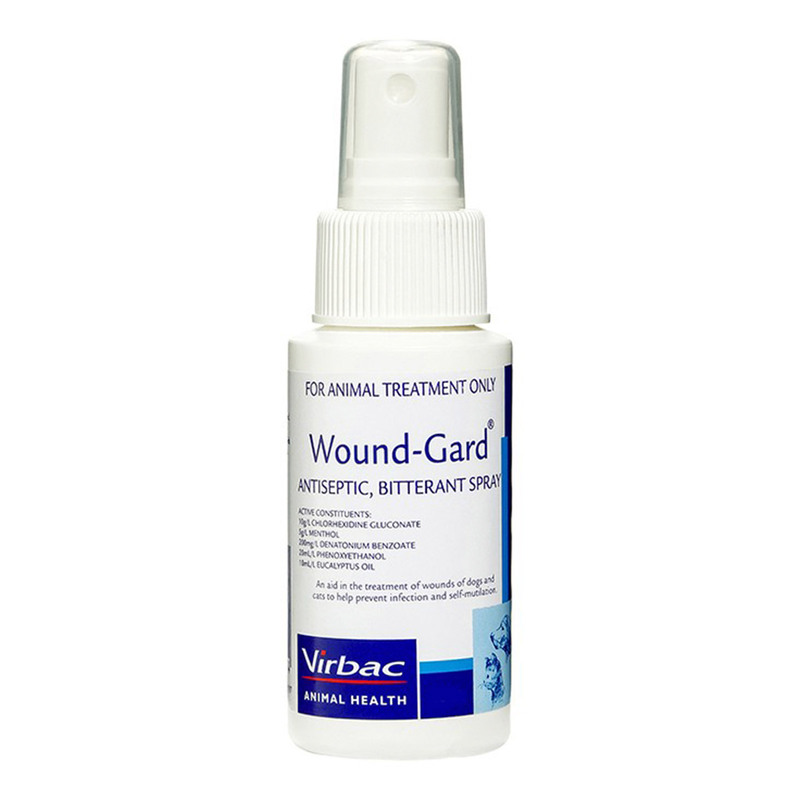 Wound Gard is an excellent product for wound care in cats. It contains major antiseptic ingredients chlorhexidine gluconate, phenoxyethanol, menthol, dentonium benzoate, and eucalyptus oil. This scientific formulation of all these ingredients helps to heal wound faster preventing spread of infection. Wound Gard supports in curing faster, restoring your cat’s health. Remove cap and spray on the infected area liberally. Spray Wound Gard three times a day or according to veterinarian’s advice. Three to four pumps per 2 cm or 1 inch length of wound is the standard dose. Wound Gard is a scientific proven topical antiseptic bitterant spray for cats. It is highly workable for all types of wounds. Widely recommended for the treatment of post-surgical wounds of cats. The antiseptic formula controls infection and further damage of the wound. The bitterant taste helps to prevent self-mutilation and dissuades pets from licking their wounds. It disinfects wounds and promotes healing. Wound Gard comes in easy to apply spray bottle. It is suitable for all sizes and breeds of cats. Wear gloves while treating wound with Wound Gard. Store it in a dry place away from direct sunlight. Store it in a cool place usually below 30 degree Celsius. Keep it away from direct flame. No known contraindications for the use of Wound Gard in felines. I had applied this on a deep cut which my kitty sustained. Within days, the cut reduced and she was back to her feet. Simply love this product. I have a very fidgety and uncontrollable cat. She keeps on hurting herself every now and then and then licks the wound making it difficult for me to apply any ointment. For this reason, I had to buy Wound-gard so as to keep her from licking the treatment. It is effective due to its bitter taste which my cat hates and thus proves good for me in controlling the restlesness.